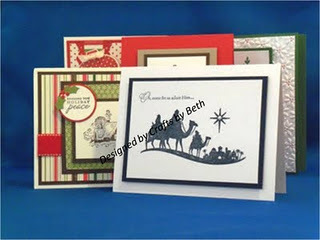 I created an "online" Christmas Card Workshop in July. An "online" workshop is designed for those who cannot attend but would like to have instructions and measurements of the cards being made during the workshop. I am offering instructions illustrated with the pictures of the five cards my participants will be making later this month. The instructions are available for the nominal fee of $3.49. You will receive by email the Adobe PDF file to download and/or print for your personal use and/or preparing for your own workshop. To purchase the instructions by email, click on the Buy Now button at the bottom of this post. You don't have to use the stamp sets mentioned above, there are so many stamps that you could substitute to personalize your own cards and/or workshops.